THE GOOD: Acura’s second-gen supercar pushes performance limits with a well integrated hybrid powertrain, all-wheel drive and dual-clutch gearbox. Adaptive suspension make it a fine road trip vehicle with head-turning looks. THE BAD: Slim availability of safety technology features. Hybrid powertrain isn’t audibly pleasing at wide-open-throttle. Infotainment system lacks a traditional volume knob on the center stack. THE BOTTOM LINE: A technological marvel that is engaging to drive with looks to boot. 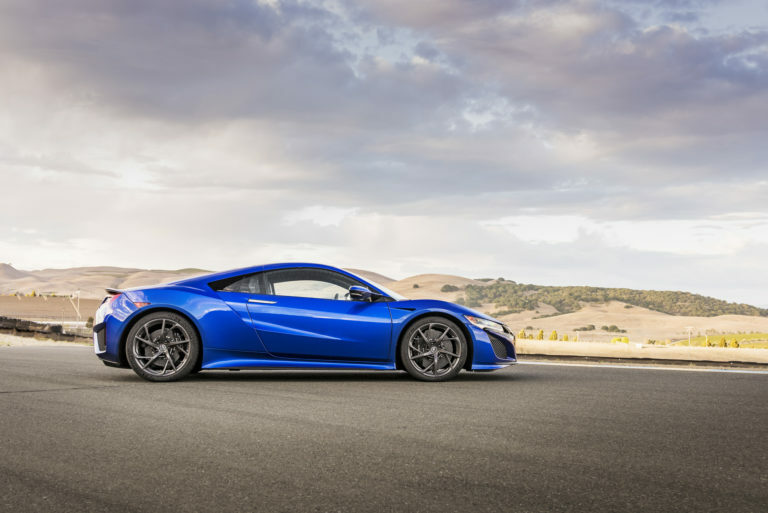 Last year, it only took 7 miles of winding mountain road outside of Palm Springs, California for me to figure out that the 2017 Acura NSX was a world-class performance car. The way it responded to steering inputs, hung on around curves at speed, rocketed out of bends, allowed late braking for corners and planted a smile on my face won me over — for the most part. Like many Honda/Acura enthusiasts, memories of the original NSX continue to dance around in my head. The simplicity of the mid-mounted V6, slick-shifting manual transmission, rear-wheel drive and balanced chassis are things I still long for. The second-generation car, in comparison, is far more complicated with a whiz-bang hybrid drivetrain, dual-clutch gearbox and the only all-wheel-drive system in the world with front wheels driven independently by electric motors. It also carries a hefty $156,000 base price. More time in the new NSX is necessary and an invite to attend the NSX Club of America’snational meet in Wisconsin, known as the NSXPO, serves as the perfect reason to get behind the wheel again. An 800-mile road trip from Detroit to the Badger state and back will provide plenty of time to really get to know the car. Seeing what previous-gen owners had to say about the current car at the biggest NSX gathering in the US should also be interesting. I-94 east in central Michigan is a far cry from the winding California pavement where I first experienced the new NSX. Straight roadways with surfaces ranging from fresh concrete to rutted asphalt score a zero on the entertainment scale, but they provide many miles to sample the NSX’s long-distance chops. Twisting the center stack Integrated Dynamics System mode dial to the left calls up Quiet mode to put the drivetrain, suspension and steering in the mildest settings, where the car putters along in comfort. Power is plenty to pass slower traffic and the nine-speed dual-clutch transmission fluidly swaps cogs. The combo averages 22.4 mpg on the expressway, supporting the EPA’s 21 mpg city and 22 mpg highway ratings for the twin-turbo V6 hybrid, which churns out 573 horsepower and 476 pound-feet of torque. Choppy roads allow the adaptive magnetorheological dampers to shine, taking the edge off bigger impacts for ride quality that’s fine for long hauls. Steering has some play on center and tightens up when dialing in more lock, while the carbon-ceramic Brembo brakes are mega strong with a firm pedal feel. The only aspect keeping the NSX from being an even better road trip companion are the available Pirelli Trofeo R tires on my test car. No doubt, the aggressive rubber is fantastic on race tracks and dry days, but a severe downpour coming out of nowhere causes the $204,600-as-tested supercar to hydroplane at 45 mph. For fear of navigating the car into a ditch, I pull over to wait out the storm. After an hour break, the heavy rain mostly subsides and I’m back on the road moving at a gingerly pace, allowing me the chance to fiddle with the interior more. There’s nothing show-stopping about the cockpit with its simple and clean layout. Soft leather, Alcantara suede and silver trim give the cabin a premium feel, and the seats are mucho comfortable with generous lower back and side support. Contrasting with the tech-filled drivetrain, infotainment and safety doodads are relatively sparse. A 7-inch center touchscreen controls navigation, there’s a crisp-sounding ELS premium audio system, as well as satellite radio and Bluetooth. It can run both Apple CarPlay and Android Auto. Two USB ports, one in the glove box and one in the center console compartment, allow me to power up smart devices. Disappointingly, there’s no physical volume knob on the center stack — that giant one you see is the mode dial. The meager safety technology menu includes a multi-angle rearview camera with dynamic guidelines and available corner and backup sensors. Features common among many luxury vehicles such as adaptive cruise control, lane-keep assist and collision warning are nowhere to be found on the NSX. From a practicality standpoint, the tight 4.4 cubic-feet trunk means packing light for trips is paramount. Finally, I arrive at Road America, the famous track nestled inElkhart Lake, Wisconsin, where the on-track component of the NSXPO is in full swing. This year’s event marks the 20th anniversary of the biggest Acura NSX owners’ meet in the US with more than 100 cars in attendance. My borrowed 2017 Nouvelle Blue Pearl NSX quickly draws the attention of folks in a paddock filled mostly with first-generation models. Throughout the weekend that includes tours of the RealTime Racing shop, RealTime Collection Hall, concours, many group photos and dinners with notable guest speakers, I field a variety of questions and give countless rides to curious attendees. Many wonder about the new car’s personality and price tag, but no passengers walk away from a spirited ride questioning the NSX’s performance capabilities. Among the dozens of people I speak with is NSX chief engineer Ted Klaus, one of the aforementioned guest speakers. Klaus plays coy throughout the weekend as I pepper him with questions about what’s still to come with the new NSX. With Honda embracing the Type R moniker again, I float the idea of a stripped down NSX. Like a good company man, Klaus says people should be enjoying the car that’s already sitting on showroom floors, but acknowledges that a Type R is part of the NSX’s history. Another hint at a potential NSX Type R comes during Klaus’ keynote presentation at the NSXPO’s final dinner where he admits that he wishes his 3,803-pound baby was lighter. Work is already being done on simplifying systems to shave weight, signaling that a slimmer NSX is in the pipeline. 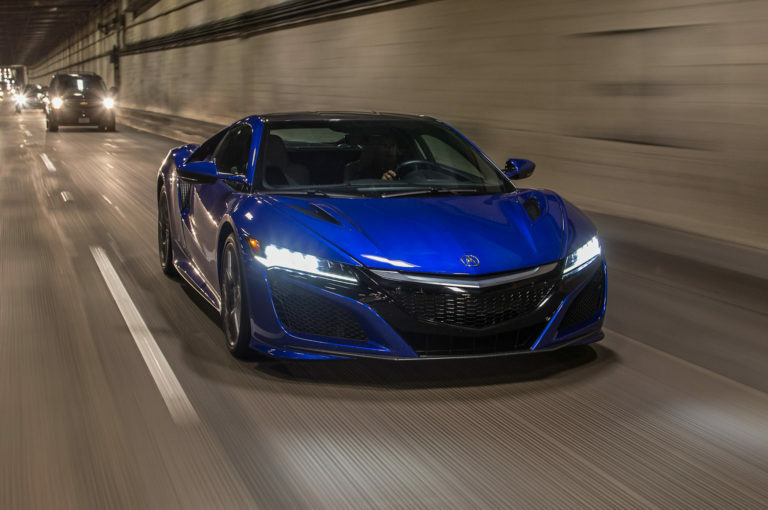 Klaus also stresses the NSX’s adoption of a hybrid drivetrain, all-wheel drive and dual-clutch gearbox are akin to the original’s aluminum semi-monocoque chassis and titanium engine connecting rods pushing the performance envelope. As much as I would love it, Acura simply rehashing the previous car wouldn’t be a proper NSX, which stands for New Sportscar eXperimental. A few miles of twisty roads before the main interstate gives me an opportunity to flog the NSX hard before a dull 400-mile run back to Michigan through the night. Race mode summons peak powertrain output and the tightest dynamic settings. Like in California, the NSX does everything I ask of it. It is engaging from the driver’s seat and doesn’t feel over computerized like the Nissan GT-R. I know there’s a lot going beneath me to draw maximum performance from the car, but it’s well masked to keep the drive experience feeling fairly pure. 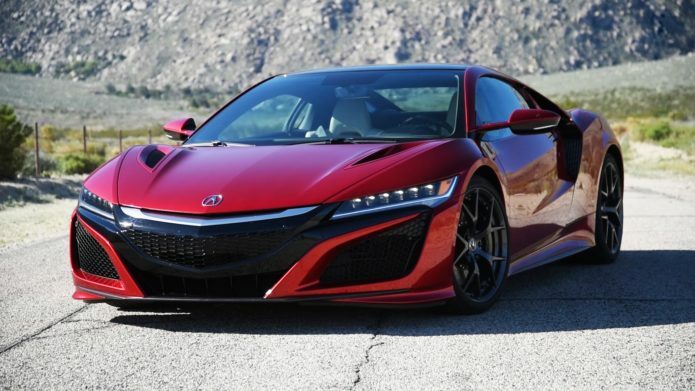 A pure driving experience is one of the things people love about the original NSX, and the new one does a good job of retaining that vital trait along with its head-turning looks and balanced all-around performance capabilities. Even I can’t deny now that Acura has built a car worthy of carrying the NSX name. It’s just a shame that more people haven’t taken notice, with sales still difficult to come by.